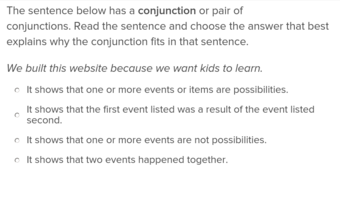 Show students how to tie a sentence together using these conjunctions exercises from Education.com. Once your students have learned how conjunctions work, introduce them to a slightly more complex concept through Correlative conjunctions exercisesThat show how to use conjunctions to introduce multiple terms into a single sentence. These exercise provide students with opportunities for independent learning and growth. Conjunctions are kind of what they sound like: They're a set of words that conjoin sentences, clauses, and ideas. They're a pretty standard part of upper elementary grammar, but that doesn't mean they can't be tricky. Conjunctions are more than just "and," "but," and "or" -- there's also "yet," "for," "nor," and more! With so many conjunctions, knowing which one to use when can be a little confusing! Help your student learn the list of conjunctions (often called FANBOYS for short), and sort them all out with our online conjunctions exercises. 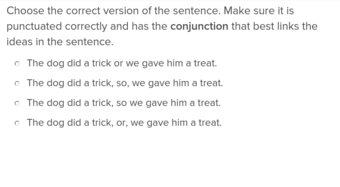 Pick the right conjunction from a list of them, or choose the correct complete sentence containing a conjunction for some quick but effective grammar practive. When your child is done with these exercises, they can move on to similar concepts like Prepositions. No matter what level of learning your child is at, we have everything they need to shine at Education.com.